1. For the bagnet, boil pork until tender in water, salt, peppercorns, onions and garlic. 2. When done, punture the skin with a fork and patdry before frying. Set aside. 3. In another pan, heat the oil and add the pork fat and cook over high heat. 4. Add the ginger, garlic, chilies and onions. Cook, stirring, until fragrant, about a minute. 5. Add in bagoong and stir for a minute. Pour in the coconut cream and simmer. 6. 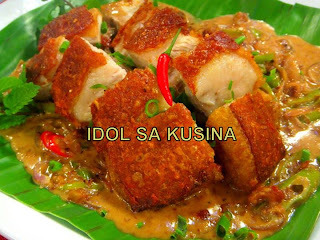 Place the crispy bagnet on top of the bicol express sauce.